How to download missing artwork images in iTunes. When scrolling through your iTunes library you may notice tracks with a generic music note displayed as their artwork. These are tracks which do not have any artwork and so a generic artwork image is used. Tune Sweeper is here to help! Tune Sweeper will scan your iTunes media library and display any tracks that currently do not have any artwork. You can then choose to allow Tune Sweeper to download the missing artwork for the selected tracks. Tune Sweeper displays any downloaded artwork so that you can preview it before saving it to the file. Once you are satisfied with the downloaded artwork, it can be saved to your tracks with a single click. Add some personality back into your iTunes library! 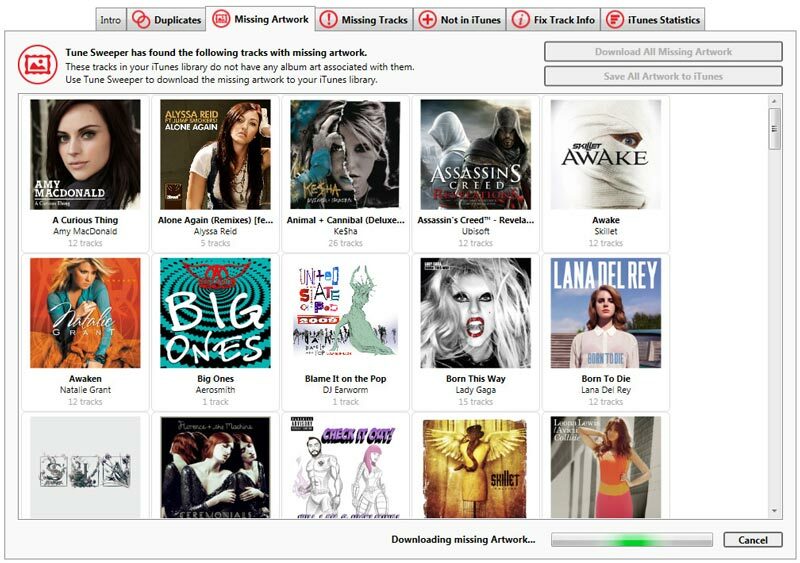 Follow our quick and easy guide to start downloading missing iTunes album artwork using Tune Sweeper.